QUITO, Ecuador , Jun 17 2018 - More than 3.2 billion people, or 2 in every 5 people, are impacted by land degradation today and up to 143 million people could move within their countries by 2050 to escape water scarcity and falling crop productivity due to the slow onset impacts of climate change. To avoid these threats, Monique Barbut, Executive Secretary of the UN Convention to Combat Desertification, has called on consumers and the private sector to join governments to save healthy land. She added that lack of preparedness for future droughts in particular, could lead to massive social and political upheavals. “Everything we produce and consume has a land footprint. A bicycle requires 3.4 square meters of land. Ten square meters of land are used to produce a laptop. Producing one kilogram of beef takes 22 square meters,“ but few people give thought to these daily processes “because the losses are not visible – or at least not accounted for – in the products we consume,” Barbut stated. “We are all decision-makers because in our daily lives, our choices have consequences. Our small decisions transform the world,” she stressed, and called on consumers to make choices that reward land users whose practices protect the land from degradation. Barbut, who heads the international agreement that deals with desertification, land degradation and drought effects, also warned that it is dangerous to reduce the true value of healthy land to its economic value alone. 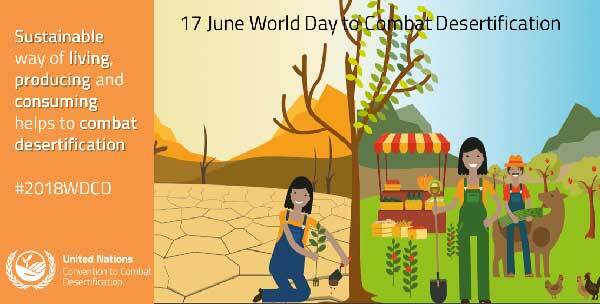 She made the remarks in observance of the World Day to Combat Desertification on 17 June. The global observance event is took place, in Quito, Ecuador. Ecuador promotes a bio-economy among its agriculturalists in order to diffuse sustainable land management technologies, which maintain the land’s productivity. The country is also pursuing the Sustainable Development Goal target of achieving land degradation neutrality, which means avoiding, reducing and reversing land degradation to ensure the amount of healthy land it had in 2015 is the same in 2030, and stays stable thereafter. “Land is worth so much more than the economic value we attach to it. It defines our way of life and our culture – whether we live in the city or the villages. It purifies the water we drink. It feeds us. It surrounds us with beauty. But, we cannot meet the needs and wants of a growing population if the amount of healthy and productive land continues to decline so dramatically,” Barbut said. The Global Land Outlook (The GLO) of 2017 states that 45% of the food consumed globally comes from the world’s dryland areas, and that falling productivity, food shortages and water scarcity in these regions is creating insecurity. The GLO warns that about 20% more productive land was degraded from 1983-2013, and that Africa and Asia face the greatest threats, going forward. “We must do far more to recognize the immense value of healthy and productive land in strengthening the resilience of the world’s poorest communities, which are facing more drought and other slow-onset climate disasters,” said António Guterres, UN Secretary-General, in marking the Day. Five of the 8 slow onset events identified by the Climate Change Convention as potential future sources of huge losses and damage are manifestations of declining land productivity. These are desertification, salinization, land and forest degradation, biodiversity loss and rising temperatures. Globally, about 2 billion hectares of land are degraded. Most of it can be restored back to health. “Science has given us the knowledge and tools we need for managing land to build resilience to drought and the impacts of climate change. Governments and the communities whose lives and livelihoods depend on the land can take steps now to prepare for future drought,” Guterres said. The sustainable land management technologies needed to minimize and reverse many of these effects exist, but the policy instruments and investments to promote their spread are non-existent. As a result, some of the most land-dependent communities are exposed to the growing powerful and adverse weather effects, such as recurrent droughts, unpredictable rainfall and disappearing ground water sources. Barbut highlighted three critical actions that consumers and the private sector can take to encourage land users and governments to save healthy land from further degradation and to recover nearly barren lands. First, changing consumer behavior and unsustainable production patterns. Second, adopting more efficient land use planning. Third, creating mechanisms like the LDN Fund that will motivate the private sector to invest in land restoration. “The public needs to be empowered. If they know that the choices they make every day can make a difference in terms of how the land is used – whether it is abused or nurtured – I am sure they will choose and consume more wisely,” she said. “Governments must create incentives that can encourage the private sector to see that sustainable management of the land and the restoration of degraded land is the socially responsible thing to do. The UNCCD is ready to help initiatives that can restore degraded land at scale,” she said. World Day to Combat Desertification is observed every year on 17 June to raise awareness about the status of the land resources, especially at country level, and to mobilize required actions.